A reflection of the days when house was born: “122 BPM” features a number of unreleased and hard-to-find tracks from early to late 1980’s. 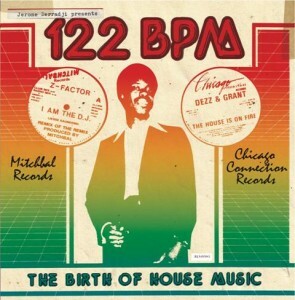 It’s not about the house Trax built, but a compilation from the catalogs of Mitchbal Records and Chicago Connection Records. Gospel and rhythm in the blood, the kings and queens of the scene stimulate a hedonistic party in “122 BPM” with sexed-up grooves from the jack’s adolescence. Some tracks have felt the rotation like “Fantasy” by Z-Factor Feat. Jesse Saunders or “I Can’t Forget” by Mr Lee, but there is plenty to discover in Libra Libra, Dezz & Grant, Risque Rythum Team, McGhee, etc. Most often Chicago house means producers like Mr Fingers, Marshall Jefferson, Lil Louis, found on numerous compilations on the theme. “122 BPM” offers many interesting discoveries from a different angle with a triple-CD or double-LP, plus a single featuring Frankie Knuckles’ project Unfinished Business with “Out Of My Hands”.